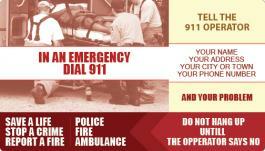 During emergencies, there are lots of confusions due to panic. Many times people forget whom to call and what to do when they start struggling and panicking on seeing their troubled loved ones. You can help them out in the right way by offering these 4x7 custom dial 911 magnets 20 Mil round corners. These made in USA emergency services magnets will not only help to improve public perception about your brand but also comfort people when they need it the most. These personalized magnets are ideal for any type of business, organization and cause that cares for people’s welfare. Order today to get started! Request a quote to know the value savings that you can avail on bulk orders of 4x7 personalized dial 911 magnets 20 Mil round corners.